AN independent audit has praised the arrangements that help to keep vulnerable people safe in the Anglican Diocese of Portsmouth. The audit, published in January 2016, concluded that Portsmouth's Church of England diocese was well on the way to developing a robust safeguarding culture to protect children, young people and vulnerable adults. The significant emphasis on safeguarding has come from the top, with the bishop providing a clear lead. Auditors from the Social Care Institute of Excellence were impressed with the openness and desire to learn evident within the diocese, and the commitment of clergy, staff and volunteers to care for those vulnerable older and younger people who engage with its churches. 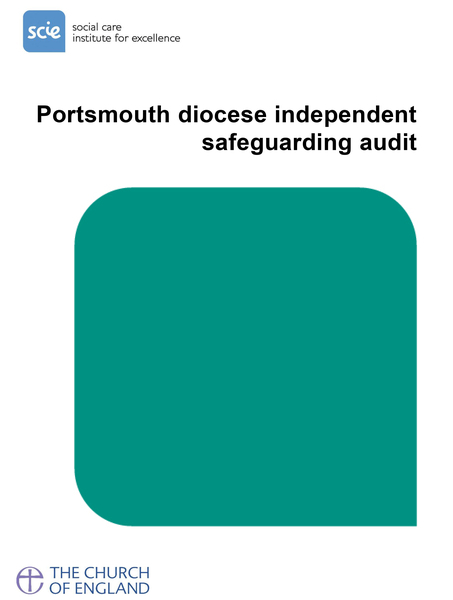 Portsmouth was one of four dioceses in the Church of England to pilot a new system of independent safeguarding audits. The others are Blackburn, Durham and Salisbury, who also published their reports on the same day. The Archdeacon of the Meon, the Ven Gavin Collins, who serves on the diocese’s Safeguarding Panel, said: “Portsmouth was happy to volunteer as one of the four dioceses that would pilot these independent audits. We saw this as a welcome opportunity to be scrutinised and to find out what needed to improve. “We know that the culture of safeguarding has been transformed over the past few decades, both in the Church and in society as a whole. We all recognise the risks to vulnerable people more clearly, and rightly expect policies and procedures to be in place to deal with those risks. The audit found that Portsmouth diocese had adopted comprehensive safeguarding policies, and a clear structure for managing safeguarding in the diocese. Clergy, staff and volunteers who work with children, young people and vulnerable adults were given appropriate training, and knew their responsibilities to report any concerns. An impressive 1,900 lay volunteers had been given safeguarding training. One area for improvement was an improved way of storing information about training and DBS checks that had been undertaken. The bishop, the Rt Rev Christopher Foster, was praised for his clear leadership on safeguarding issues, as was the diocesan Safeguarding Panel, which has an independent chairman and oversees the effectiveness of safeguarding arrangements. The system of management, oversight, checks and balances between those involved was praised. The report said the diocese’s safeguarding team works well, the skills and experience of the two diocesan safeguarding advisers complement each other, and the team has a wealth of experience. One innovation in Portsmouth was the development of ‘parish reviews’ – sending an experienced professional to work alongside 10 parishes chosen at random, to help them to evaluate how good their safeguarding arrangements are. The plan is to make this a regular event for every parish in future. The independent audits in the four dioceses were carried out by the Social Care Institute for Excellence, SCIE, a charity and leading improvement support agency specialising in safeguarding. The audit process in each diocese involved examination of safeguarding leadership arrangements, local policies and practice guidance, the quality of case work, recruitment and training. The auditors also looked at the progress being made in reaching nationally agreed standards, informed by central House of Bishops approved policies. These audits will take place in other Church of England dioceses in 2016 and 2017. To read the full safeguarding audit for our diocese, click here. Anyone who is affected by a safeguarding issue, particularly in light of this report, should feel free to come forward in confidence and they will be listened to. Details of how to report concerns and find support can be found here. Copyright © 2019 Diocese of Portsmouth, Privacy. Design by DEV.